Belgian Aromatic Malt - 19L - 1 lb. Dingemans 19 °L Aromatic Malt is a kilned specialty malt from Belgium designed to boost both the malt flavor and aroma characteristics of a recipe. The flavor of this malt is very bready, somewhere between Munich and Biscuit Malt, with a matching aroma. Great for adding maltiness without the sweetness of caramel malts. 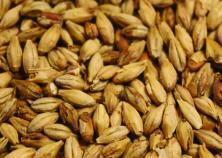 Try Aromatic Malt at lower rates for any American or British style of beer or any recipe which is malt forward. Mashing this specialty grain is suggested as it has not been pre-converted like a caramel malt. For more information on various malts and grains, take a look at Byron Burch's Guide to Malts and Grain.